Thanksgiving is by far my favorite holiday. What could be better than a day dedicated to spending time with friends and family… and of course there is the food aspect of Thanksgiving that cannot go unmentioned. Thanksgiving snuck up on me this year. I have come to realize that for someone who is used to seasons changing, time seems to stand still in Thailand. The weather has only fluctuated about 10 degrees in the last 4 months. It is absolutely mind blowing when I try to wrap my head around December being only a few days away. Needless to say, Sean and I were both a little down, wishing we were spending the holidays with our families. 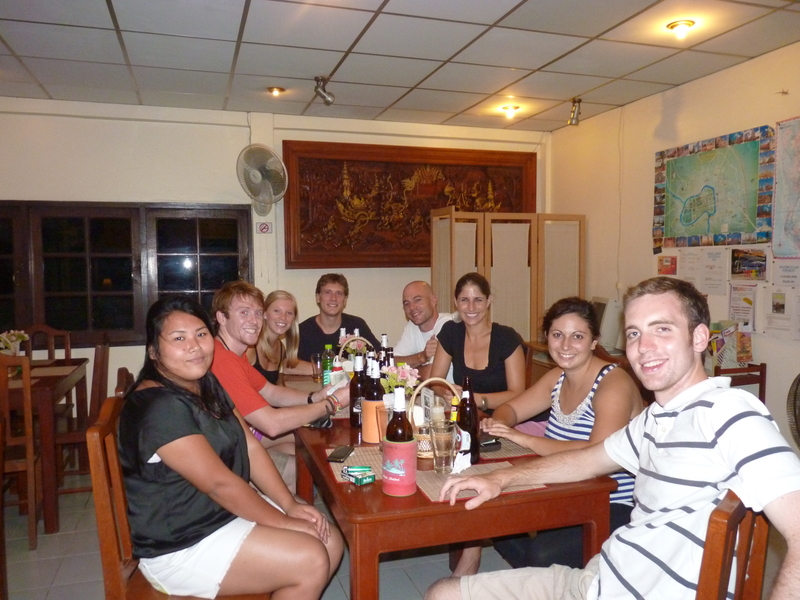 The two of us, along with 6 other Americans and our Thai friend, Ann, went to the Sherwood House (a guesthouse on the island of Ayutthaya owned by a Brit) this past Wednesday night for a feast. 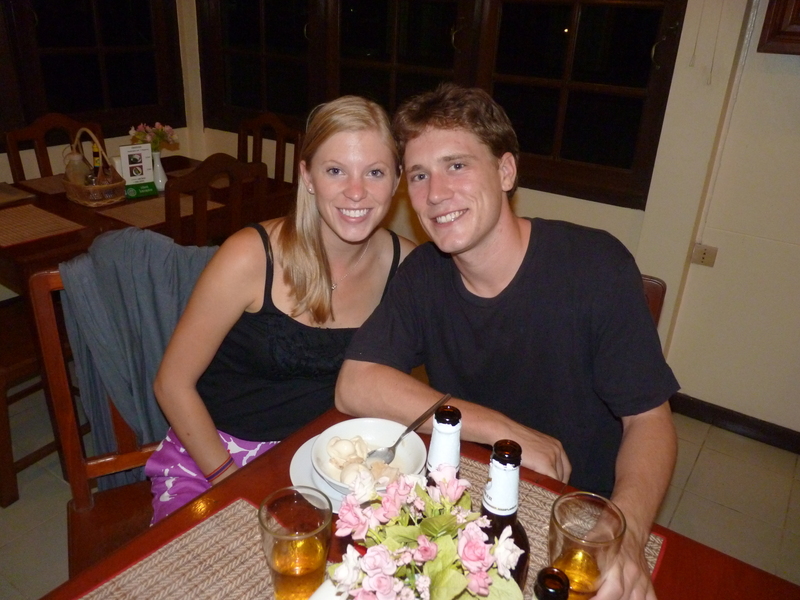 Even though it was technically November 24th, we all sat at a big table, drank Thai beer and ate mashed potatoes. 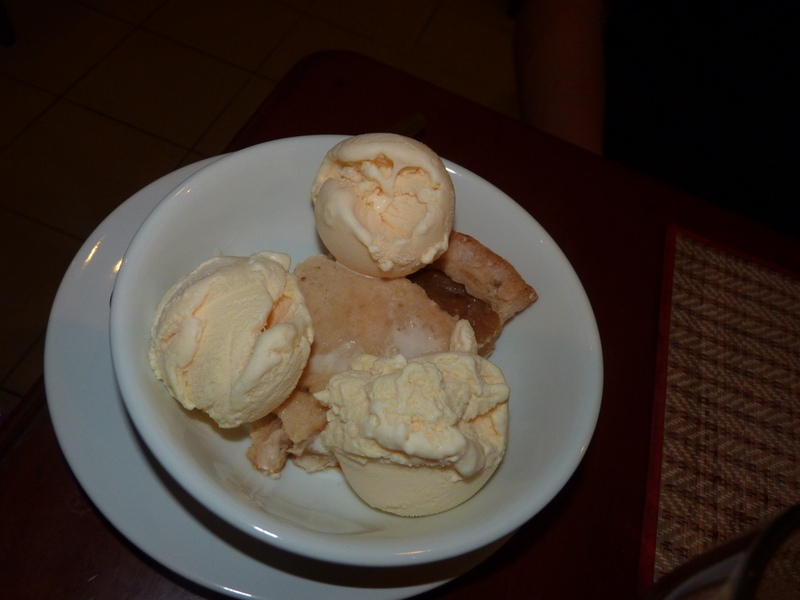 To top off the night, we indulged in apple pie with vanilla ice cream. I can speak for each person at that table that it was the biggest and one of the tastiest meals we had had in a long time. So even though we were not able to be home for Thanksgiving, we had a wonderful night celebrating new friends, eating western food, and being thankful for our friends and family at home who supported our crazy decision to move to Thailand. I am so glad you got some “home” cuisine! There was one store in Bkk that sold a bunch of American food, and they’d have turkeys for sale around Thanksgiving. My mom would get our family in the States to send us pumpkin pie mix and cornmeal, and we’d do our best to put together a Thanksgiving meal with some American friends !